Good Mother Stallard are heirloom beans, pole variety. I bought them from Seed Savers Exchange in Iowa, and they are the only beans to survive the relentless onslaught of the Chipmunk Hordes. I was determined. I wanted these beans, that promised to be the prettiest of the bunch, and I was not disappointed. The vines, after the 3rd planting, topped the 7′ tall trellises and still reach for the sun. I have picked one quart’s worth, and the vines are still heavy with pods in all stages of ripening. I sat with Husband on the front porch, shelling beans, with a bowl in my lap, and my hand dipping into a pile of yellowed pods that rustled with every selection. 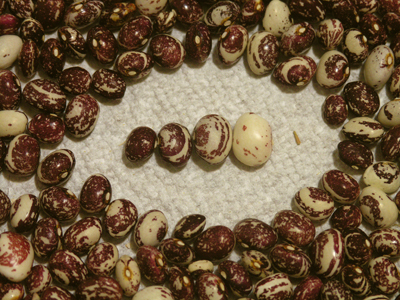 Shaking out the beans on a paper-towel lined tray, I marveled at the beautiful maroon and cream color of the beans. Look at this harvest! The beans filled the tray, and caught the light, shiny and bright. Good exposure (pun) for an artistic arrangement that shows off their variety of color. I found a recipe on a fellow-bloggers site — see up above and to the right. I will continue to harvest, save, and collect recipes. I will share. 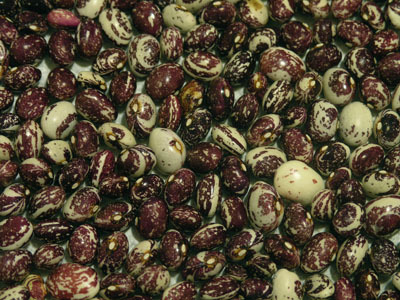 Place Good Mother Stallard beans, lima beans and corn in a large, heavy skillet. Add olive oil and toss well to cover. Heat mixture on medium high heat for about 8 minutes, until hot all the way through. Add salt, pepper and nutmeg, adjusting to your tastes (I prefer a heavier dose of nutmeg and pepper and less salt). Serve immediately.